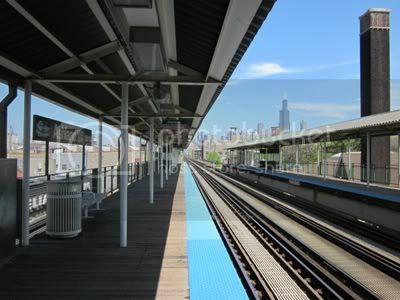 A view of downtown from the El platform from one of my adventures this past week. (3) I biked 20 miles, for a challenge total of 157.5 miles (or 71.6% of my goal). (4) Didn't complete the Wii time. I'm not upset, though, because the weather was absolutely gorgeous this week, so I made sure I was out and about as much as possible. I walked over a marathon's worth of miles last week! (5) I completed goal #75 (try 2 new fish) when I tried octopus for my final meal with meat (I made seafood tacos). I wasn't a fan - which is odd, because I like squid! I've been trying a lot of new vegetables, so goal #73 is coming along nicely as well. Three words: chocolate mud masque. Oh my goodness gracious. I love how relaxing mud masques are to begin with, but this one smelled sweet and chocolately. It was heavenly. How do you measure success of your goals? I think it depends on the goal. With weight loss, I like seeing the numbers drop on the scale, but more important to me is feeling in control and not eating emotionally. For non-scale goals, maybe it's a little silly, but I fully believe when I have tried my hardest, I've succeeded. What is failure to you when it comes to goals? Falling short isn't failure to me - that means I'm on the right track, I just need to try harder or differently. For me, failure is the second I give up. If you could hop on a plane right now, where would you go? You have some great tips Mary! Sounds like a great week! Care to send some of your motivation my way?